The NRAO announces the Call for Proposals for trimester 2010B. The call is open now and will close on February 1, 2010 at 17:00 EST (22:00 UTC). The October 2009 call for proposals, covering the first trimester of 2010, included a number of new capabilities. Expanded Very Large Array (EVLA) Early Science is expected to begin in March 2010 following the shutdown of the old VLA correlator and the transfer of hardware to the new EVLA WIDAR correlator. Similarly, the new DiFX software correlator, with increased science capabilities, will go into routine operation for Very Long Baseline Array (VLBA) programs. At the Green Bank Telescope (GBT), the pulsar Spigot and spectrometer system was being retired in favor of the new Green Bank Ultimate Pulsar Processing Instrument (GUPPI) pulsar back end. The first trimester of 2010 also marks an operational milestone with all three of NRAO’s current telescopes using dynamic scheduling as the default scheduling mode. The GBT and the EVLA/VLBA Proposal Selection Committees (PSC) met in the second week of December 2009 to review the referee rankings and technical reports for all proposals, with the goal of providing a recommended science program to the NRAO Director’s Office. A list of the approved EVLA, GBT, and VLBA/High Sensitivity Array (HSA) observing programs for Trimester 2010-A is on-line. The National Radio Astronomy Observatory invites nominations for the 2010 Jansky Lectureship. The Karl G. Jansky Lectureship is an honor established by the trustees of Associated Universities, Inc. to recognize outstanding contributions to the advancement of radio astronomy. First awarded in 1966, it is named in honor of Karl G. Jansky who, in 1932, first detected radio waves from a cosmic source. Please send your nomination, including a concise justification for your choice, to Billie Orahood (borahood@nrao.edu) or to the Office of Science and Academic Affairs, National Radio Astronomy Observatory, 520 Edgemont Road, Charlottesville, VA, 22903-2475, by Friday, February 26, 2010. As 2009 drew to a close, the Atacama Large Millimeter/submillimeter Array (ALMA) passed a key milestone to cap a year that had begun with the first detection of radio waves by a single antenna. ALMA astronomers and engineers worked together to successfully link three antennas at the 5000m (16,500 ft) elevation Array Operations Site (AOS) in northern Chile. This first step on the path to the sensitive, precise, high-resolution imaging which will be an ALMA hallmark demonstrated the success of the full electronic and software system now being installed. The ALMA phase closure, as this test is called, came as part of an ongoing series of tests beginning in late November. It was a key step to the beginning of the formal commissioning period, which leads to Early Science and, of course, completion of the construction. "This successful test shows that we are well on the way to providing the clear, sharp ALMA images that will open a whole new window for observing the Universe. We look forward to imaging stars and planets as well as galaxies in their formation processes," said Fred Lo, NRAO Director. At a recent review, it was decided that the commissioning period will begin on 2010 Jan 22, coincidentally one year from the establishment of ‘first light’ at the Operations Support Facility. This intense period will see the addition of the other antennas already on-site. Twenty-two antennas are in various stages of erection in northern Chile. 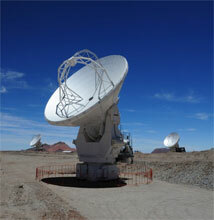 Five of these antennas are already being used by ALMA; additional antennas await their turn in the queue. The two antennas at the lower-elevation Operations Support Facility will soon be linked together in a rebirth of the test interferometer there; testing of new software, antennas and other equipment normally will proceed on this instrument while commissioning tasks occupy the array at the AOS. Recently, a software upgrade has been tested at the AOS array. This upgrade will enable many new capabilities, such as phase correction using the water vapor radiometers (WVRs) and broadband spectroscopy. In a test of ephemeris capabilities, the interferometer recently observed the four Galilean satellites of Jupiter. Appropriately enough, the date of this observation was exactly four hundred years after Galileo’s 11 Jan 1610 discovery of the these remarkable moons. 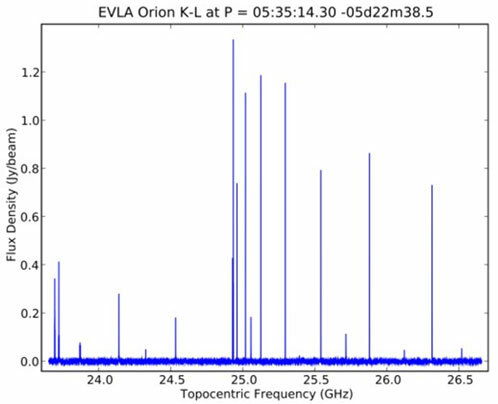 The current transition from the VLA correlator to the new EVLA WIDAR correlator introduces changes in the way observations are being prepared. Previously, observations using the VLA correlator were prepared with the JObserve software, but the new expanded range receiver tuning and configuring of the very flexible WIDAR correlator has required the development of a new web-based application: the Observation Preparation Tool (OPT). A preliminary version of the OPT has been in use since March 2009. This preliminary version was used mainly to prepare observing schedules, or scheduling blocks, for observing using the new Ka-band (26.5 - 40 GHz) receivers. Special temporary code was introduced to configure the (old) VLA correlator. 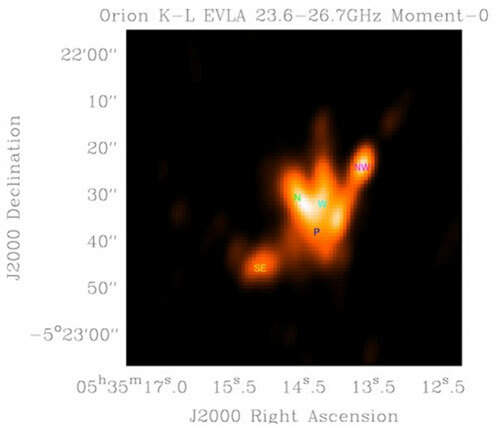 With the shutdown of the VLA correlator JObserve will no longer be used to prepare observations for the EVLA. All new observations must now be prepared using the OPT. Release version 1.0 of the OPT is now available, which accommodates all correlator configurations supported under the Open Shared Risk Observing program. The OPT can be accessed through the NRAO user portal by selecting the "Obs. Prep." tab in the Dashboard. The Common Astronomy Software Applications (CASA) package, being developed by NRAO and ALMA, will be used for offline reduction and analysis of both ALMA and EVLA data. The first non-beta version of CASA, R3.0.0, was released on 2009 December 23. Linux and MacOS (10.5 and 10.6) distributions are available from the my.nrao.edu portal. CASA is fully scriptable. It offers: (1) a growing suite of data reduction tasks written in C++ with a Python interface; (2) plotting through matplotlib; and (3) a Qt-based viewer and plotter. CASA is now being used regularly for ALMA commissioning in Chile and for filling as well as inspecting data from the new EVLA correlator. 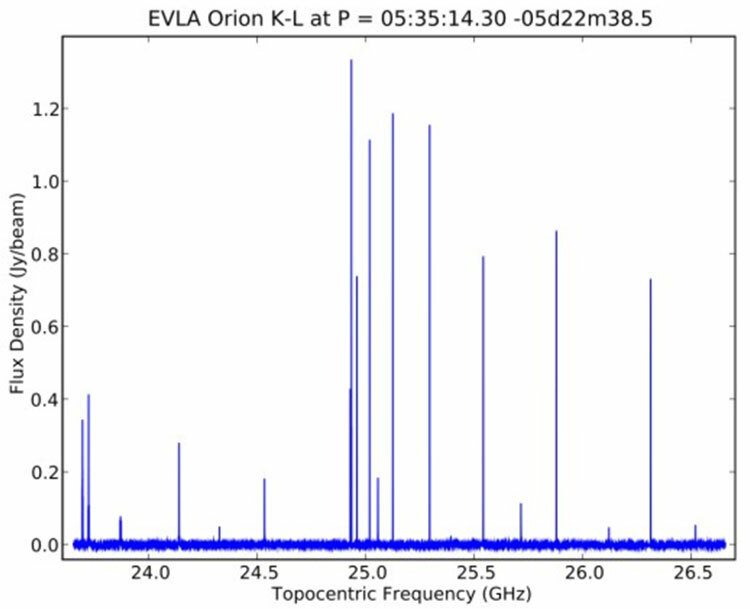 Also, a complete end-to-end reduction of Orion K-L yielded images as well as wideband maser spectra with 24012 channels (see figures). CASA tutorials have been held in Santiago, Chile; Socorro, NM; Garching, Germany; Mitaka, Japan, Hamilton, Canada, and Paris, France; reaching about 200 participants in total. A number of additional tutorials are planned for 2010 and beyond. CASA supports direct import of data in ALMA, VLA, and EVLA formats, and almost any data that can be written to uv-fits can also be imported and reduced (for example BIMA, CARMA, SMA, ATCA). For further information, consult the CASA homepage. I am very pleased and proud to announce that Scott Ransom has been awarded the 2010 Helen B. Warner Prize for Astronomy by the American Astronomical Society (AAS) "for a significant contribution to observational or theoretical astronomy during the five years preceding the award." Specifically, Scott is cited by the AAS for "his astrophysical insight and innovative technical leadership enabling the discovery of exotic, millisecond and young pulsars and their application for tests of fundamental physics." This is a very prestigious award for a young scientist. Please join me in congratulating Scott! As the NRAO prepares for the coming impacts of the EVLA, ALMA, and other wonderful developments, our Education & Public Outreach (EPO) team is organizing itself with enhanced abilities to engage a geographically diverse community of students and science-interested public in the adventure. We formally distinguish between two threads of effort, News & Public Information and Education. At NRAO HQ in Charlottesville a new Media Studio is taking shape in a former storage room, staffed by specialists in public science communication and equipped with the mechanisms for producing visually-rich web pages, Youtube videos, and the like. 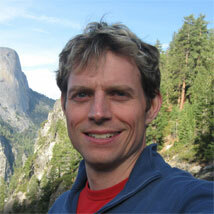 This past summer, our new Multimedia Designer, Jeff Hellerman, joined the staff. He brings skills in graphic design, photo composition, and the creation of motion graphics, and is currently acquiring skills as a video editor. In January, we welcomed Tania Burchell as our new Science Writer. Tania comes with a rich background in astronomy outreach and communication, having worked at the Harvard-Smithsonian Center for Astrophysics, Boston’s Museum of Science, the University of Leicester, and the National Space Science Centre (the last two of which are in Leicester, UK; the Space Centre is a big space museum there). Together with our Press Officer (Dave Finley), Artist (Bill Saxton), and Web Designer/Programmer (Taylor Johnson), they’ll be undertaking to develop a range of new public offerings, including media-rich public website content, supplemental background materials to accompany press releases, and videos, presentations, and exhibits for broad public dissemination. Current projects underway include the development of “virtual site tours” of NRAO facilities, and illustrated expositions of key radio astronomy science topics. New technical capabilities we’re developing to support this effort include HD video production and high-resolution astronomy visualization. In the realms of formal and informal education, we continue to operate excellent visitor programs in Green Bank and at the VLA. Recently, Green Bank Education Officer Sue Ann Heatherly was appointed Senior Education Officer for the Observatory. With the NRAO for over twenty years, Sue Ann has led the development of the unique, powerful, scientist-involvement-rich, hands-on-with-real-gear education programs that have become an NRAO hallmark. In her new position, she’ll be helping us to develop an observatory-wide education program in which we can deploy resources where needed, when needed. We’ll also be working to broaden the diversity of the audiences we serve, by enabling more people in more places to benefit from our educational opportunities through distance learning, distributed learning, and expansions of existing on-site programs to serve students from all over the country. So that Sue Ann can focus her efforts on these initiatives, we’re currently recruiting for a new Education Specialist in Green Bank, someone who can shepherd the visitors and students who come every day. Look for visible results from these efforts in coming months! 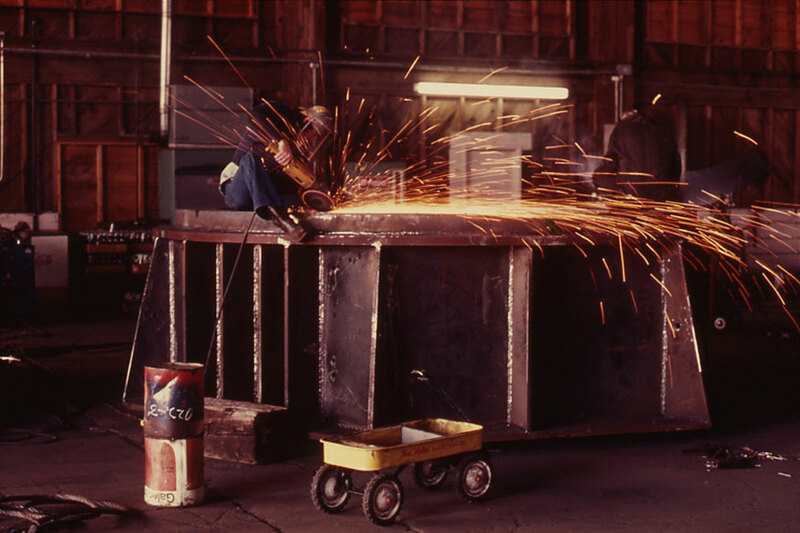 Machining the azimuth bearing box for Very Large Array (VLA) antenna #4 in Hobbs, NM, January 1976. The VLA antenna contractor was E-Systems, Garland Division, Dallas, Texas. They used a fabrication plant in Hobbs belonging to Structures, Inc. to fabricate the various steel antenna structural parts, and parts were then shipped to the VLA for final assembly. Thanks to Lew Serna for background information on this photo. NAASC Postdoc: The North American ALMA Science Center (NAASC) located at NRAO headquarters in Charlottesville, VA (on the campus of the University of Virginia) invites applications for a postdoctoral fellow to work with the NAASC scientific staff as it gears up to support the needs of the community when ALMA early science begins in 2011. The successful candidate will be encouraged to use the ALMA data reduction and analysis package CASA (Common Astronomy Software Applications, see http://casa.nrao.edu/ for details) in their scientific research and provide feedback, and will help develop ALMA tutorials and other user-outreach materials. Software Engineer II (CASA Programmer): The Common Astronomy Software Applications (CASA) group has an immediate need for development of high-performance computing algorithms/packages and cluster environment support. The Software Engineer will develop high-performance computing algorithms/packages and cluster environment support. Software Engineer II (SSS Programmer): We are seeking a Software Engineer to be part of a team that creates software that allows astronomers from all over the world to configure observations on the Expanded Very Large Array (EVLA). In addition to writing the observation preparation software, the team also writes software for accessing the data taken by the telescope, and in-house software for scheduling observations on the instrument. ALMA Science Operations Astronomers: The Joint Atacama Large Millimeter/submillimeter Array (ALMA) Office invites applications for the position of Science Operations Astronomer, based primarily in the ALMA offices in Santiago, Chile. The successful candidates will support the Commissioning and Science Verification team, assisting the Project Scientist in planning and executing the scientific commissioning of ALMA before ALMA early science operations (2011) and will participate in tests and evaluations of the ALMA control software and software tools for science operations, and in the planning of science operations. Software Engineer II (CASA): The National Radio Astronomy Observatory is seeking a Software Engineer II for their Common Astronomy Software Applications (CASA) division in Socorro, New Mexico. Astronomers and programmers from US, Europe, Canada, Japan, and Chile are actively developing and using CASA. There are several Qt based applications that will need to be extended and supported by the Software Engineer. Software Engineer III: The National Radio Astronomy Observatory in Socorro, NM is seeking a skilled developer to participate in the development of the observation scheduling and pipeline data-reduction subsystems. The successful candidate will display a strong working knowledge of Java and of object-oriented analysis and design. The ability to learn new computer techniques (languages, methodologies, etc.) quickly and independently is required. Excellent software technical documentation skills are required.